The little white sign says: “For transportation of hazardous waste only”. There’s irony and a little danger riding in this truck. 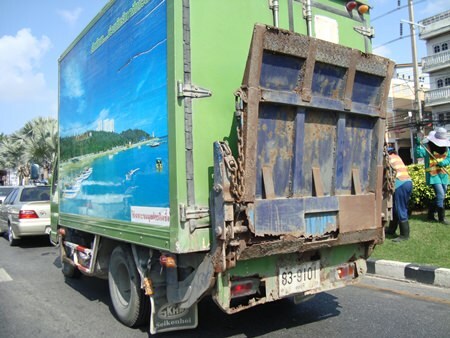 Emblazoned with a lovely view of Pattaya, the rolling rust-bucket is filled with contaminated waste. The rusted and rotted steel rear platform stands in stark contrast with the picturesque view on the side. 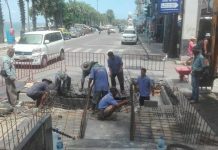 And while driving behind it on Sukhumvit Road, one has to cringe and keep their distance, thinking that the rotting steel could have been caused by leaking toxic waste. If not, from the looks of things, a poisonous leak is not far off in the future.